Ward Equipment offers an excellent American Made Skid Steer Tire Options by Carlisle. We have everything from standard duty backhoe tires, to extreme duty harsh environment tires for both off-road and highway application. We also offer our Prowler Tire Seal, for extra protection. 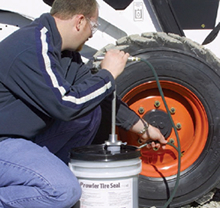 Prowler Tire Seal is a cost-effective and non-hazardous tire sealant made in the USA. It offers light-weight tire protection, sealing punctures up to 3/8″ in diameter. Prowler Tire Seal is the only sealant in the market that contains Kevlar®, a durable, high tenacity fiber that is 5x stronger than steel on a weight to weight bases. Just think, stopping one puncture can pay for the cost of the sealant itself, not including your downtime to repair the flat. Prowler Tire Seal is a perfect fit for construction applications, including mining, agriculture, construction, landscaping, and waste management. Want to add this to a set of your own tires? Be sure to give us a call and we will pre-fill each tire with 60 to 75 ounces of sealant. The Trac Chief XT standard duty tire is an excellent choice for skid steers, backhoes, subcompact tractors, and aerial platform lifts where you may need an extra carrying load all-purpose tire option. If you are looking for extra skid steer performance, choose the Carlisle Guard Dog HD. They have increased puncture and abrasion resistance, coupled with deeper tread depth. Designed for optimum service life, even in harsh environments. The Carlisle Ultra Guard is a severe duty skid steer tire with an open shoulder design, excellent for tough off-road conditions, with an increased abrasion resistant tread compound. This tire has extra deep tread depth and a high ply rating making this tire a must have for extreme environments. The Carlisle Ultra Guard MX, like all the current Ultra Guard series, is designed for severe duty applications. Yet, provides a unique tire feature specifically designed for off-road and highway applications. The Ultra Guard MX includes a premium chip and chunk-resistant compound, reinforced sidewalls with rim guard technology to help protect them against job site debris. They also feature a unique shoulder grip to increase bite in soft soils. Their robust center lugs and large footprint area provide more stability, while the deep tread lugs offer extended wear and puncture resistance. The Carlisle Ultra Guard LVT is an extreme duty skid steer tire with two wide pattern blocks for increased tread wear, smoother ride, and extended service life. The Ultra Guard LVT also feature a thicker sidewall for enhanced sidewall protection, and a center bar for extended tread-wear life at its crown. Ultra Guard LVT’s performance excels when resistance is needed on the job site against abrasive materials such as rocks, gravel, concrete, or general demolition. Pro-flex tires are made from a Severe Duty mining tire type compound and will last 3 to 4 times longer than a standard skid steer tire. Best of all, “No Down Time”! Just take your old wheels off and bolt these on, that’s it. Pro-flex rims are reversible so you can mount them in either a narrow or wide configuration on most machines. Prowler’s new Pro-Flex “Progressive Flex ” technology has taken the aperture tire design to another level with a new approach to the flexible concept of semi-pneumatic tires. Most semi pneumatic tires offer two designs, single or double aperture. Single hole aperture designs like the Prowler Pro-Flex will provide you with a softer ride and increased load capacity over dual aperture tire designs.